I like small wallets and I carry a lot of cards: loyalty cards, gift cards, my essential cards (ID, credit/debit). Paper bills and coins, not so much. I imagine I'm not the only one in this boat, so why do companies keep making bulky wallets with bill and coin compartments and individual card slots?! You know the ones I'm talking about. They're huge once they're full and don't fit into anything smaller than a tote. 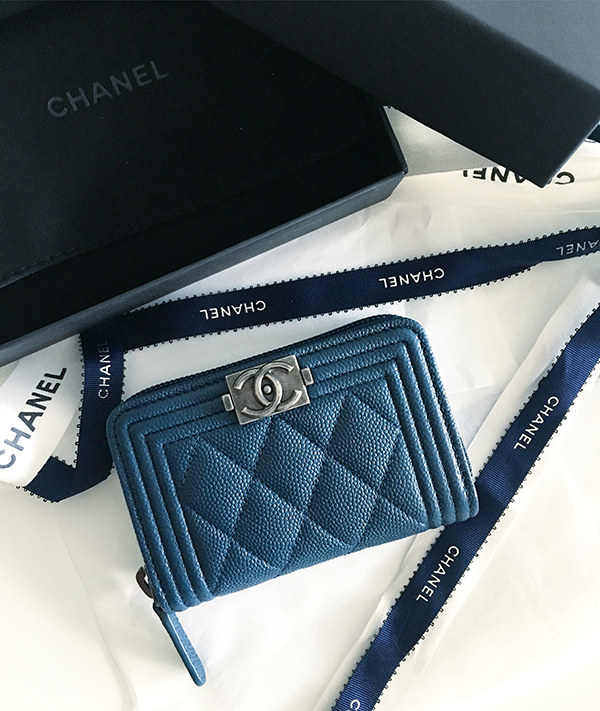 I wanted something that had just enough compartments to keep my cards organized into broad categories but was still compact, and this style of Chanel wallet fit the bill perfectly. Currently I have 18 cards crammed into it along with a couple of bills and coins. Once unzipped, it accordions out into 3 sections. Zipped up, it sits perfectly in the palm of my hand when I'm running out for coffee or lunch. It's small enough for me to switch between different-sized handbags easily. And oh man, that new leather scent—I forgot how good new Chanel leather goods smelled. It's been almost 9 years since my last Chanel purchase (a black lambskin wallet on chain with embossed camellias and silver hardware) and about 8 years since my last wallet purchase (Ferragamo, red saffiano leather, gold hardware). I still have both of those pieces. Did I need to spend $$$ on a Chanel wallet? No, but this was totally a #treatyourself moment, and based on past precedent, I knew it'd bring me joy and I'd cherish it for a long time to come. Haha a bad influence for good!